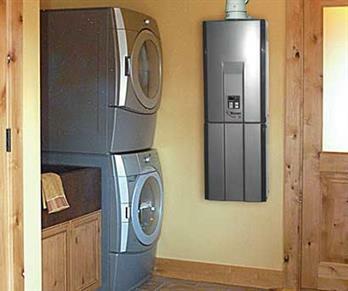 Tankless, or demand, water heaters have long been fixtures in Europe and Japan. With the new push in the United States toward more energy efficiency, these water heaters are gaining popularity. Instead of always using energy to heat a large tank of water as conventional water heaters do, these tankless heat water on demand and offer an endless supply of hot water to the home. Like many things, there are some problems with this technology, but with a bit of research, the tankless water heater it’s a valuable option for the household. Most people are familiar with the shortcomings of traditional water heaters. They use more energy in a home than anything except heating and air conditioning. In most houses, you must restrict the amount of hot water-using appliances which are running at any given time. The horror of having someone turn on the dishwasher while you are in the shower is a scenario that is familiar to many. Tankless water heaters fix many, but not all, of these problems. Both electric and gas models run the same way. Cold water is delivered via a pipe into the small, wall-mounted unit. Because there is no tank to empty, the quantity of hot water flowing through the tap is infinite. Putting the unit closer to the point of use can increase both the efficiency and speed that the warm water is delivered. Although they typically cost 2 1/2 times greater than a conventional hot water heater, this price can usually be made up in energy savings within a couple of years. The average tankless consumer saves 30-45% in energy use every year. Often a tax credit can be obtained for purchasing a tankless water heater, which can help offset the cost. Due to the calculations needed to determine which model is appropriate for your use and the difficulties involved in installation, this isn’t normally a do-it-yourself project. It is very important to employ a qualified plumber or contractor to install your tankless heater. Because they are small, tankless heaters save space both in the house and at the landfills when their useful life is finished. They can be mounted either inside or outside of the house and because the gas versions are sealed, they don’t have any open flame. This versatility has a price. Smaller units often can’t provide simultaneous use in larger houses. Often, another unit is installed which is dedicated to all those appliances which use the most hot water, such as dishwashers and washing machines. It can also take longer for the hot water to get to the tap, which may lead to water waste. It’s possible to speed this process using different models or installing a pump to assist the water as it travels. Companies that sell tankless water heaters can help you calculate your usage and install the right sized unit for your dwelling. It is up to the individual homeowner to decide whether a tankless water heater – or 2 – is the correct option for their dwelling. If energy savings is a long-term target, the first expenses and minor problems involved in installing a tankless heater will probably be outweighed by the impressive reduction in energy needed to operate these water heaters.